One of the things I found most stunning about the houses owned by Historic New England was the beautiful selection of wallpapers. Some of them were original to the homes, some had been installed during restoration projects, but all added an additional dimension to the history of design and interior decoration on display. Historic New England has a whole section of its website devoted to wallpaper, and I have been combing their collections database and historic reproductions trying to decided which is my favorite. It’s an impossible task, but the paper above is a strong contender. I got to see it in situ at Beauport, the summer home interior designer Henry Davis Sleeper constructed in 1907. Sleeper purchased this 18th-century Chinese wallpaper in pristine, unused condition, and designed an entire room around it. I would too, if I had the good luck to find 18th century wallpaper in someone’s attic! What feature, found in only a handful of 18th-century homes, does the Hammond-Harwood House share with the Warner House in Portsmouth, New Hampshire? I’ll give you a minute to think about it. The answer is…doweled floors! Using dowels rather than nails to attach floorboards was more complicated and therefore significantly more expensive. Warner House was built in 1716 for Archibald Macpheadris and the bills from its construction still exist. Joiner John Drew charged Macpheadris 30 shillings per one hundred square feet to install the doweled floor but only 12 shillings per one hundred square feet for the rest of the floors. Unfortunately we don’t have the bills from the construction of the Hammond-Harwood House, but because of the ways the floors have worn down in the small parlor of the first floor we are able to show visitors just how they were put together. It’s a small detail, but a unique one that ties the Hammond-Harwood to some of the grandest Colonial houses in America. Next week I will be at the Program in New England Studies, hopefully amassing a wealth of knowledge about American decorative arts at various historic houses and museums in Massachusetts, New Hampshire, Connecticut, and Maine. I am so excited to get to see incomparable collections of antiques and hear about them from experts in the field, and hopefully to share some of the information with you on the blog while I’m there. For now, here is the dining room at Otis House, a Federal period home built for lawyer and politician Harrison Gray Otis in 1796. When restoring the room, the staff used an 1824 painting entitled “The Dinner Party” by Boston artist Henry Sargent for guidance on details like wallpaper and carpet. I think you’ll agree that the results are beautiful. I can’t wait to see it for myself! Yesterday I was fortunate enough to get an incomparable, and historical, view of Annapolis. 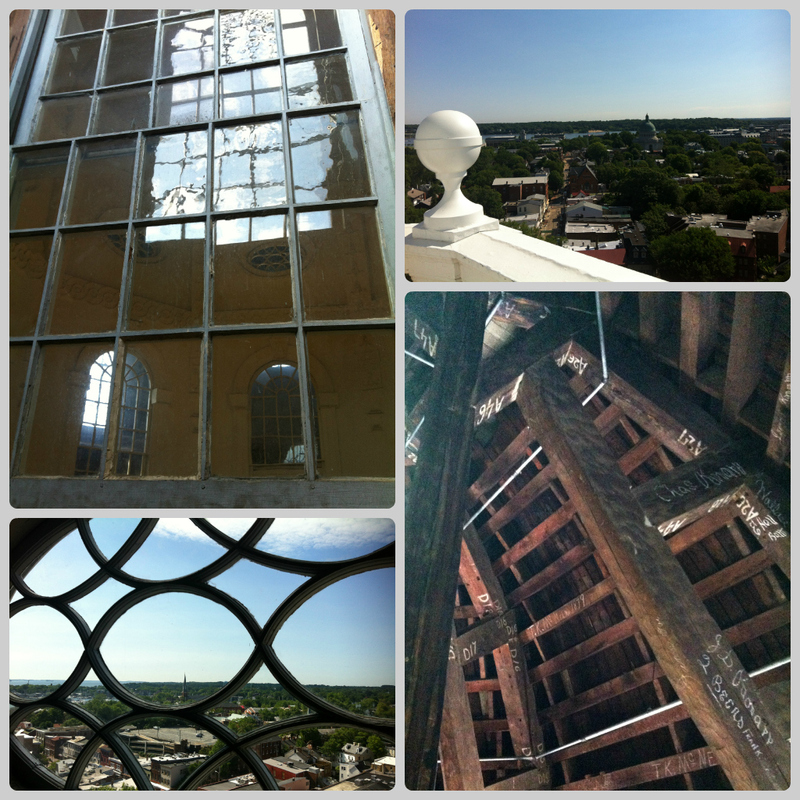 I scaled the stairs of the State House to the top, marveling at its construction along the way. The Maryland State House was built in 1779 and is the oldest state house still in legislative use. Its dome was enlarged in the 1780s to better fit the scale of the building. I was astounded by the dome’s construction; there are no structural nails, only mortise and tenon joints and wooden pegs holding the massive beams together. And there are actually two domes, an interior dome and an exterior dome, with stairs in the space between the two. The Annapolis Capital featured the home of John and Louise Hammond as their Home of the Week! The Hammonds’ lovely garden will be part of this weekend’s Secret Garden Tour (Saturday & Sunday, noon-5pm, are you tired of me telling you about it yet?). Check out the article to see more pictures of their colorful home (and adorable grandson).